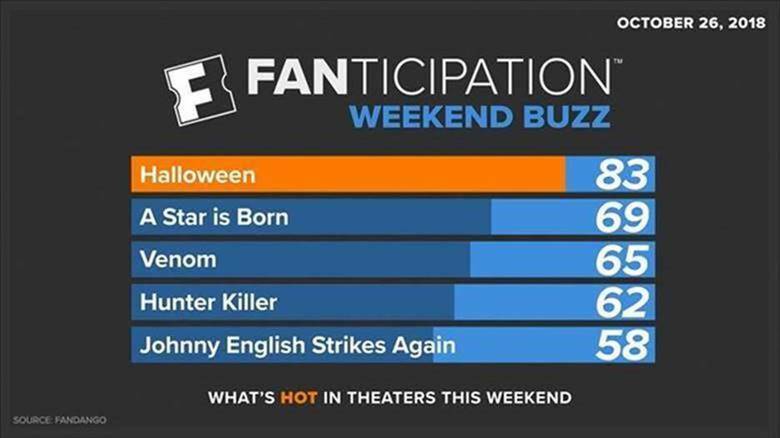 Los Angeles (October 25, 2018) – “Halloween” stays a cut above the competition in its second week of release, carving out the top spot in Fandango weekend ticket sales. The Jamie Lee Curtis sequel is scaring up 83 out of 100 points on Fandango’s movie buzz index, Fanticipation. FandangoNOW, Fandango’s fast-growing streaming service, has a new offering in the first-of-its-kind “Binge Bundle” rental program, including multiple titles from fan-favorite franchises to special-themed collections for one low price. The latest Binge Bundle comes from A24 and offers three contemporary chillers, “Hereditary” (Toni Collette), “The Witch” (Anya Taylor-Joy) and “It Comes at Night” (Joel Edgerton), all available to rent as a Halloween binge package for $9.99. “The Twilight Saga” is also available in 4K ULTRA HD for the first time, with all five movies available for purchase for $29.99.